Who is Reputation Aegis for? If your Company doesn't work in markets exposed to Consumer Reviews (Hotels, Restaurants...) and has not worked on its Reputation yet, it most likely falls into this category. Having NO REPUTATION is considered as harmful as having a BAD REPUTATION! If you are in this position, it's time to ACT! A BAD REPUTATION can be hard to repair depending on how damaged it is, but it can be done... and fairly quickly if you implement the right strategies. You are certainly on the right track. Most likely, your Products or Services are outstanding but not enough of your customers give feedback. What would happen in the event of a downturn? Are you prepared? Your Good Reputation has not yet reached the threshold where you can just sit back and relax! Are you using the full power of Customer Intelligence to increase Sales? Great! You have earned your 5 stars... but are you spending countless hours monitoring your Reputation, making sure it remains the same across the many Social and Review Sites! Wouldn't your time be better spent working ON your Business? Are you using the full power of Customer Intelligence to increase Sales? Bottom Line: You need Feedback from Real Customers! That's just what Reputation Aegis does! 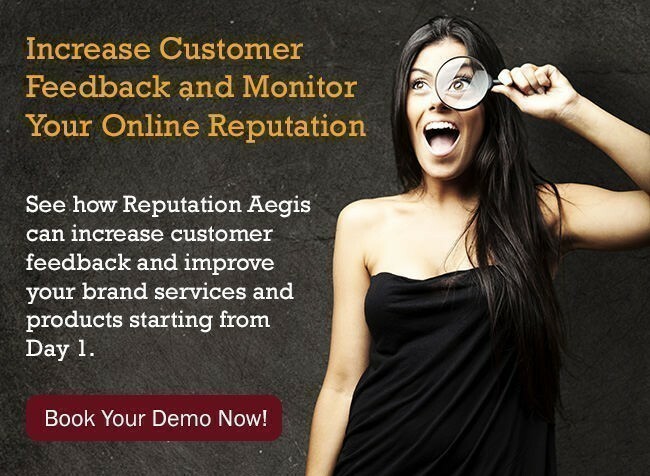 We have carefully designed Reputation Aegis to be the Definitive Customer Intelligence Platform. The Platform helps: measuring the current state of your Customer Experience, establishing and maintaining a 5-Star Customer Experience. The platform will Market your success, Online & Offline and Monitor any change in status. How to reach a 5-star Reputation explained! How does it work?